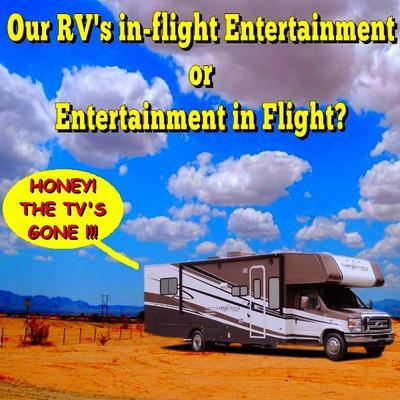 Editor's Note: This story was submitted on our Share You Funny RVing and Camping Stories Page. My husband and I had been talking about getting a tiny house for a few years, but had recently decided that an RV may be the best way to go. It took some doin', but I convinced him that a motorhome would be best, since it would mean we didn't have to buy a vehicle to tow it with. What a happy April Fool's Day we had, when we drove our RV home. I kept wondering if someone were going to jump out of the CR (We call our toilet closet the comfort room) and yell, "April Fools! We're takin' it back!" After a month, no one took it back, so we planned a trip. My mother owns property out in Brunswick, Georgia, but we live in Warner Robins, Georgia. This would be our family's maiden voyage. When I say family, I mean our brindle colored catahoula mix, our 7 year old son, and our 4 year old son, and the two of us. I spent a week doing up laundry, grocery shopping , meal planning... And yet, I wasn't finished putting away all of the laundry (we're moving into the RV full time). So, I put a basket of laundry and other odds and ends in the master bedroom, on my side of the bed (the side with a little more wiggle room, and the TV cabinet overhead). THAT look. I'm just saying, as a newbie, there is no greater fear than that of a germaphobe mommy who can't get the potty to flush, or wash her hands. As we left one of these said potty breaks, and I pulled out across the street (I've also learned to only stop at stations on the right side of the road), I accidentally hit the edge of a curb with my back tire. This not only set off my walkie talkie ("Mom-my! New tires! "), but it caused a huge jump and a loud thump, followed by a louder more disturbing thump. I wondered what had happened, but didn't want to alarm the hubbster. So, I checked mirrors, and listened carefully as we drove along. Hmm, sounds fine. No worries. So, we get to our destination, and set camp. We have supper. We settle the children in the over cab bedroom that is their sanctuary. I get ready for bed, and decide that I want to see what the digital box can pick up on the antenna. I meander into the bedroom, telling myself that I'll put the laundry away tomorrow. Tonight, it's TV time! I plop down on the bed, and get all comfy on my side. Pillows in the right place and all. I hit the remote button, and look up toward the open TV cabinet door. "HONEY! THE TV'S GOOOONNNEEE!!!" He comes running. By the time he makes it back, I realize, it's not gone. It's laying in the basket of clothes. On further inspection, we discover that the coaxial connector has broken off. The cord kept it from hitting so hard that it broke the screen, and the basket kept it from rattling around, but the connector needs some soldering. How it happened: In the days before the trip, I became frustrated with the cabinet door drifting closed, just about the time that I'd get comfy in the bed. So, I'd tied a loop of string around the door handle and the curtain rod, to hold it open, with the thought that I'd take it down before hitting the road. But, I'd forgotten to do so, during my 3 walk around inspections, and the hubbster hadn't noticed because he'd been busy, too (he does outside walk arounds, and I do the inside ones). 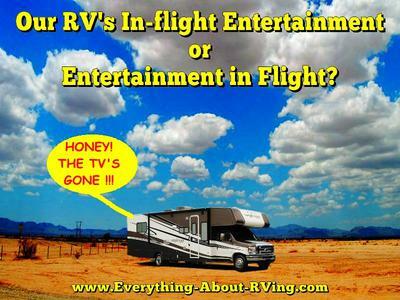 Comments for Our RV's In-flight Entertainment or Entertainment in Flight? My mom owns property there, so we stayed on her land. However, our first night it was too dark to cut our way into the property with a chainsaw (it has really grown up since we were there last October). So, we parked over in the FlyingJ parking lot on Hwy. 82. They have a dump and fill station, and a gas station. We ran the generator until the A/C cooled the rig enough for us to sleep, then turned it off. It didn't seem to bother anyone. Besides, most of the Semi trucks were running for the same reason. There is a KOA not far from there, also, but we've never stayed there. When we were kids, Mom paid for us to swim at the KOA, because it wasn't far from home. The best part about staying the night at the FlyingJ: Denny's has free internet, and I LOVE their food, and we don't have one close to us in Warner Robins (it's a pretty good drive out to Byron, if we want Denny's). Having grown up in Brunswick I'm just curious, what campground did you stay at? When we go full-time that will be one of our destinations.